The first of the pair is finished and a complete success! 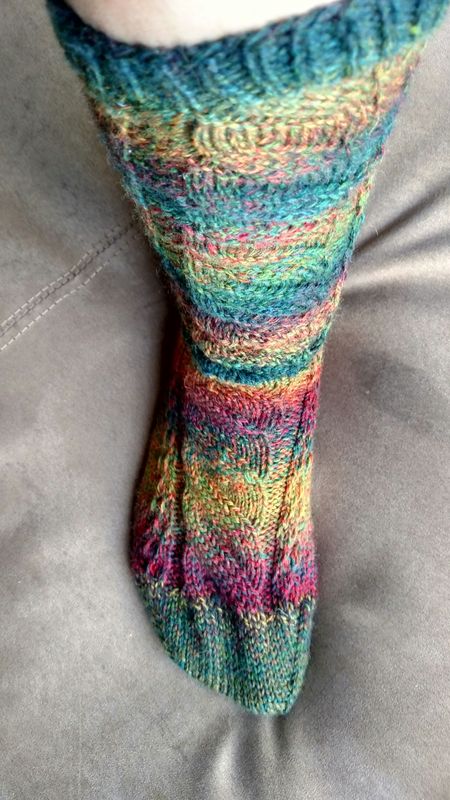 How happy was I to find that unlike the first pair I knit, this one fit perfectly! 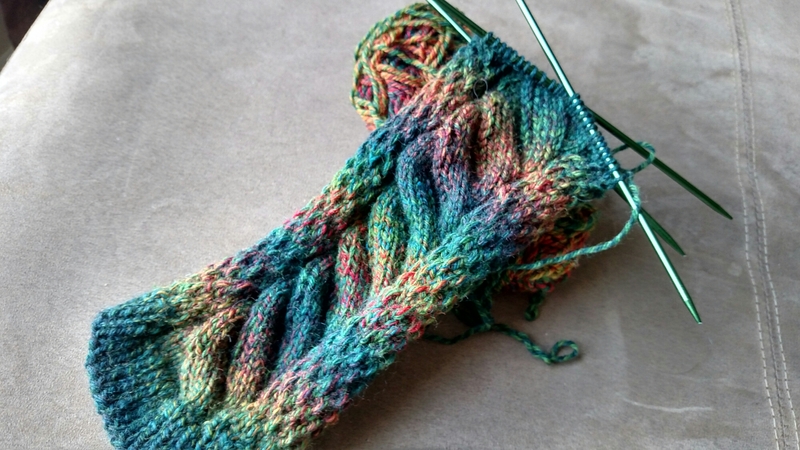 I’m so glad I bit the bullet and pulled and started over so I could cast on more stitches. I actually completed it a few days ago but storms and late work nights meant poor lighting to take pictures of the finished product. The second is coming along nicely and – seeing as how my boss told me to take the day off today “because [I] deserve it”- I plan to get the second done by this weekend. I was so happy to see the pattern emerge and how the colors played a roll and complimented the pattern so nicely. 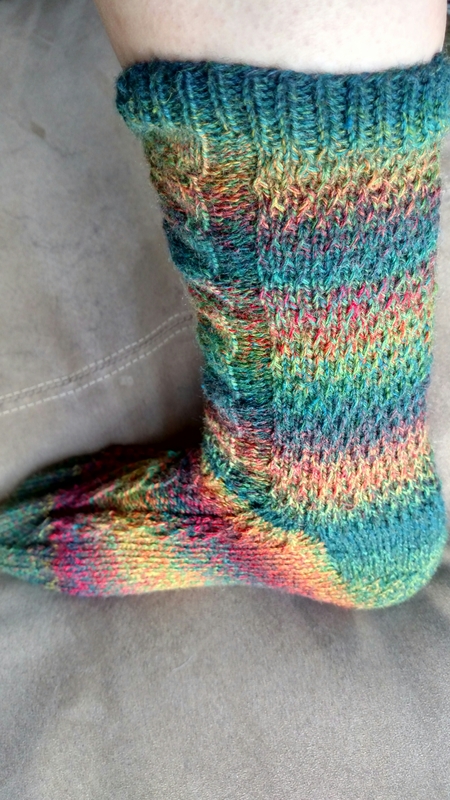 The back of the sock brings up images of fairy tale dragons for me, or the story from when my girls were little of The Rainbow Fish. What do you think? The back at the halfway point. 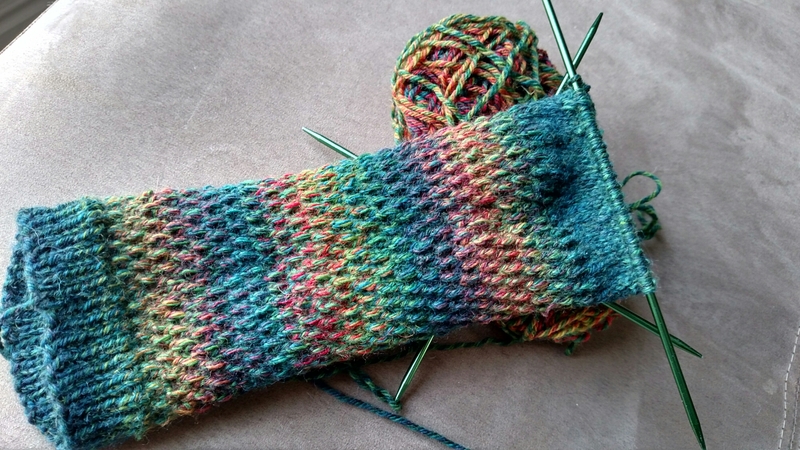 Just starting on the heel. I did start out using 4 needles, but because of the added stitches to the back it made more sense to combine the 2nd and 3rd needles into 1, to allow for the whole of the cable pattern to be on one needle. Things went much smoother and quicker working on 3 instead of 4. Even though I’ve been knitting for nearly a decade, it’s only been the last couple of years that I’ve really gotten into it, though it does take a back seat to gardening, yard work and camping in once it gets warmer. Still, I find that every new product I finish, even knowing there are flaws in each piece, gives me pleasure and pride. I wonder, for those that are no longer among the novices. Does that ever go away?